It was a very good year for me and Opera. Here’s the best of it. Putting this together was fun but confusing. I spent the first half of the year in New York and the second in Europe with a stop in California in between, so I had a fabulous variety of performances to choose from. Compared to prior years, it was an embarrassment of riches. This is the kind of problem one wants to have. But this list doesn’t correlate with my reviews very closely. I write a positive review of any performance that I think is good, but the ones I have the most affection for are usually those of works that I personally enjoy (Cardillac was an excellent performance, but it is not on this list). And sometimes the review I write a day or two after seeing something is a poor indicator of how much it will linger with me in following weeks and months. This is what I remembered. Honorable Mention: Semele (Theater an der Wien), Tosca (Metropolitan Opera, April), Les Troyens (Deutsche Oper Berlin). 10. Carmen, Met (d. Richard Eyre, c. Alain Altinoglu, April) Two really great principals made this memorable without help from Richard Eyre’s mediocre production. 9. The Nose, Met (d. William Kentridge, c. Valery Gergiev) A perfect marriage of Shostakovich’s wacky collage score with William Kentridge’s artwork. 8. Lulu, Met (d. John Dexter, c. Fabio Luisi) A finely balanced performance of one of the greatest of 20th-century operas. 7. The Fairy Queen, Glyndebourne Festival/Brooklyn Academy of Music (d. Jonathan Kent, c. William Christie) Pure fantasy with excellent orchestral playing and a hilariously fanciful staging. Now available on DVD. 6. Adriana Lecouvreur, ROH Covent Garden (d. David McVicar, c. Mark Elder) An extravagant and lushly sung star vehicle that never got buried in its own upholstery. 4./5. (tie) Tannhäuser, Wiener Staatsoper (d. Claus Guth, c. Franz Welser-Möst) and Tristan und Isolde, Opernhaus Zürich (d. Claus Guth, c. Bernard Haitink) A brilliant Guth double-header considering Wagner through the lens of 19th-century society, with excellent musical performances on both counts. 3. Aida, Staatstheater Basel (d. Calixto Bieito, c. Maurizio Barbacini) Brutal and sometimes gruesome, but a revelatory, amazingly relevant interpretation that turned the tables on this problematic work. 2. Der Ring des Nibelungen, Los Angeles Opera. (d. Achim Freyer, c. James Conlon) A rigorously conceived, visionary production with a highly personal style and generally strong musical values. 1. Rusalka, Bayerische Staatsoper (d. Martin Kusej, c. Tomas Hanus) An immensely moving production with incredibly committed performances, a remarkably complete re-imagining of a distant fairy tale into something horrifyingly contemporary and immediate, and yet still faithful to the sad longing of Dvorák’s music. Special Award for Ladybusiness: Aida (Basel) and Rusalka (Bayerische Staatsoper) for compelling, three-dimensional conceptions of female characters who are usually denied inner lives. Special Award for Awesome: Their productions might not have been all that great, but Petra Lang (Les Troyens, Berlin), Anja Harteros (Alcina, Wiener Staatsoper), and Nina Stemme (Ariadne auf Naxos, Met) were. Special Award for Prolific Overachievement: Jonas Kaufmann. “Prolific” is due to my repeated efforts to track him down, but he’s seemingly fantastic in everything, so it was worth the effort. Special Award for Tech: Rusalka (Bayerische Staatsoper). A complicated production perfectly executed, large quantities of water, collapsing walls, and (fake) dead animals included. Special Award for WTF? (Short Form): The last 20 minutes of Harry Kupfer’s Ariadne auf Naxos (Theater an der Wien). Zerbinetta and Bacchus… Harlekin and Ariadne… whaaaaa? Special Award for WTF? (Long Form): Don Giovanni (Wiener Staatsoper) and Armida (Met) for showing that more-or-less traditional productions can be every bit as incoherent as more radical efforts. 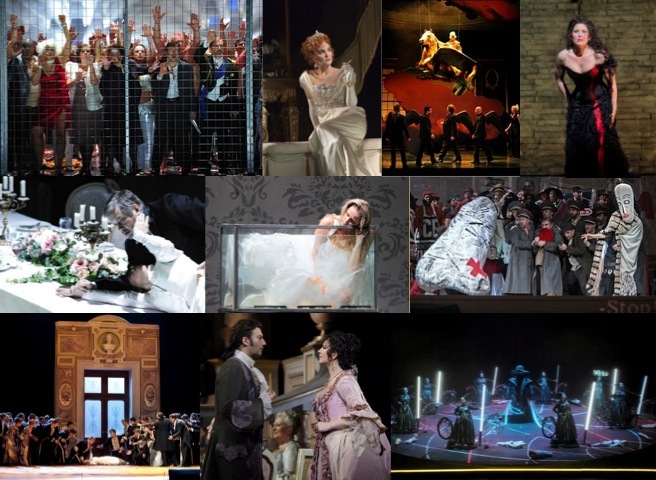 Most Popular Blog Posts as measured by Google Analytics, most popular first: Carmen at the Met (April), Adriana Lecouvreur at Covent Garden, Standing Room at the Staatsoper, Alcina at the Staatsoper, Aida in Basel, Tosca at the Met (April), Armida at the Met, Rigoletto at the Staatsoper, Semele at the Theater an der Wien, Liederabend of Popular Tenor. Blogging Lesson Learned: For the accumulation of comments, challenge the supremacy of an institution such as The New York Times, the Wiener Philharmoniker, or Juan Diego Flórez (granted, in that last one we mostly ended up talking about various other tenors hanging off lampposts). Other Blogging Lesson Learned: However, for the accumulation of sheer numbers of visitors, see “Special Award for Prolific Overachievement” and entries 1, 2, 6, and 10 on the most popular list. I’ve enjoyed perpetuating this blog’s second life (third, to tell the truth), and hope you have enjoyed reading. In other news, New Year’s is coming up, so I’ve got some Sekt to drink, a Fledermaus to see, and a Germany-bound train to catch for the other half of my Schenk project. Here’s to a great (and equally transatlantically split) 2011! Also, you want to follow me on Twitter, don’t you? Edited for broken links because Blogger hates me. Does this mean you will "end up" in the U.S. again in the long run? That would be a shame ;(. I got used to this blog … I prefer it from Vienna … the Met is covered fairly well already blogwise … sniff. You would be allowed to relocate to Berlin or Munich, though :). Or even London? Anyways have a great 2011 nevertheless :). About the blog coverage, don't I know it, my traffic is WAY better here than it ever was in the US. But I have to follow my job back to New York, and most of the rest of my non-blogging life is there too. Well, New York obviously is a great city, so what can you do :). It is a bit of a shame though, because especially this Vienna/ Germany (Munich, Berlin, Stuttgart, elsewhere) comparison works really well. The Met has the singers, but they have so many boring productions relatively speaking – not so much to say about them. For example the Tosca was booed in New York, because it "went to far" ;), whereas in Munich it was a failure, because it was too tame.